Enjoying fall weather by walking and biking to school while promoting safety information, was Safe Routes to School goal in celebrating international Walk to School day during the first two weeks of October. Four sch ools participated in the day by encouraging their students to walk or bike to school on certain days. There were classroom challenges and prizes for the children who were actively commuting. Community members and UNK athletes facilitated the students’ routes to get to school. Safe Routes goalis trying to increase the numbers of children actively getting to school. Children who walk or bike are building healthy lifestyles and gaining a sense of independence and confidence that will carry them through adulthood. “Walking and Biking is getting safer as we implement the Safe Route programs around the community. It helps with traffic congestion, which slows a lot of people down in the mornings,” said Kate Hannon, School and Community Worksite Health Coordinator. 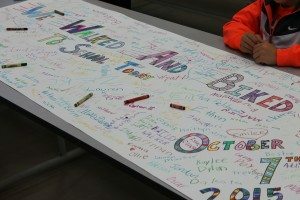 Check out http://www.activatebuffalocounty.com/ to see how you can get more involved in the community.